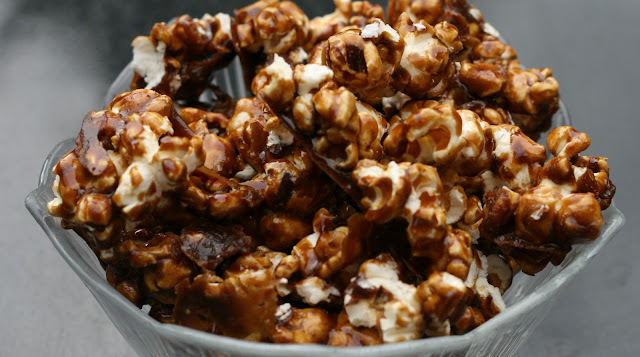 While I was trekking through the internet trying to find a good recipe for candy cane popcorn, I managed to stumble across another one for gingerbread popcorn and knew I was going to be making it as soon as possible. I've tried making actual gingerbread a few times and it always goes horribly wrong, so I was a bit worried about attempting this. Luckily it turned out perfectly, it's crunchy like toffee popcorn, but with a hint of gingerbready spice. I will definitely be making more for actual Christmas (not just the fake one that I appear to be having on my own at the moment). We based it on this recipe, but again changed a few bits and made it metric. Makes a lot of popcorn! Prepare 2 large baking trays by covering them in tin foil and spraying with cooking spray (I used good old fry light) and preheat the oven to 120 degrees. Then pop the treacle, golden syrup, ginger, cinnamon, cloves, nutmeg and salt in to a sauce pan and melt the mixture on a low heat until well combined. Bring to the boil and boil for 5 minutes, after 5 minutes remove from the heat and add the baking soda. The mixture will foam up a bit so make sure you stir it in well. Pour the mixture over the popcorn in the bowl and mix it up really well, making sure it's well covered. Spread the popcorn on to the baking trays and pop in to the oven for an hour, stirring every 15 minutes, when cooked, give it an extra stir then leave to cool completely.